Cyber Security Basics: What Is A Trojan Horse Virus? This article explores the question 'what is a trojan horse virus' and explains how proper 'forensic analysis' can prevent them from infecting computers. Trojan horse virus is a malware which masquerades itself as legitimate software and is widely employed by the hacking community to break into computers, usually to steal some sensitive data or to spy on them. Unlike computer viruses, trojan horse viruses cannot self-replicate themselves and spread within a network. They need some form of human intervention (like downloading e-mail attachment) to get activated. Just like a computer virus, the trojan horse too is a metaphor deriving from Greek mythology referring to the large wooden horse supposedly used by Greeks to transport their soldiers into Troy, in order to capture it. The 'trojan horse' malware, along similar lines, hides behind a legitimate (and therefore harmless) posing software, and infects computers when users download them. 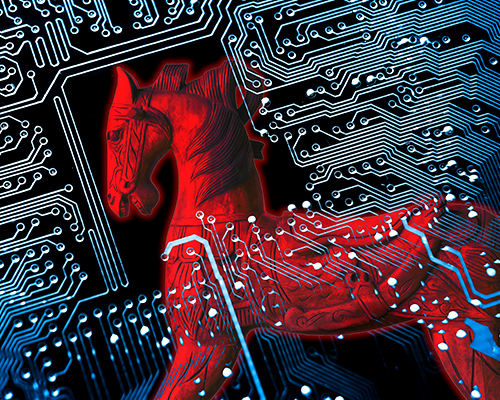 Trojan horse, just like other malware, is not just annoying but can be lethal at times. How Does Trojan Horse Virus Operate? Like said earlier, it needs human intervention to activate itself. Like downloading a file or an email attachment. And the moment it gets downloaded, it pretty much operates like other malware. That is, it steals sensitive data, crashes computers or performs other such malicious activities which affect PC(s) or the user's online identity. How Does Trojan Horse Virus Invade PC(s)? Backdoors – here the Trojan Horse creates a 'backdoor' on the computer it is infecting and thereby allows the hacker to remotely control it. It could be to steal personal data, modify computer settings with some malicious reason, or to turn the computer into a botnet for a DDoS attack. Exploits – here the Trojan Horse seeks to exploit a security vulnerability existing in one of the software(s) available in your PC(s). Rootkits – here again, the Trojan Horse enables hackers to gain unauthorized access to user computers by giving them the administrator rights. Trojan-Banker – here the Trojan Horse disguises itself as a legitimate banking website to rob users out of their money. Trojan-Downloader – here, the Trojan Horse disguises itself as a 'legitimate, downloadable software', often enticing users to download it. And More – just like many other malware, the shapes Trojan Horse takes is not exhaustive. Some of the others include Trojan-DDoS, Trojan-dropper, Trojan-fakeAV, Trojan-game thief, Trojan-ransom, Trojan-spy and Trojan-SMS. How Enterprise Forensic Analysis Can Help? Enterprises forensic analysis is the practice of scanning networks to determine and investigate any malicious activity within them. Simply put, it the process of scanning each and every file within the network in search of malicious activity, so that such activity, if found, can be remedied by taking appropriate security measures. There are many forensic analysis tools in the IT security market (some even available for free – like our very own Comodo Forensic Analysis) which generate forensic reports that not only indicate whether the network is at risk but also help in assessing the overall security posture of enterprises. Therefore choose wisely and protect your networks against not just trojan horses but all kinds of malware. Comodo Forensic Analysis (CFA) comes equipped with impressive security features that easily make it one of the best in the IT security industry. Extremely lightweight, it performs comprehensive network scans and classifies the audited files as 'safe', 'malicious' and 'the unknown'. The 'unknown files' are dispatched to Valkyrie cloud-based malware analysis which delivers malware verdicts often within minutes. As you can realize, CFA leaves no stone unturned when it comes to file analysis and therefore is a forensic analysis tool enterprises like you should be using.